A sheep EID drop-in day at Skipton Auction Mart proved a runaway success, as farmers and their families from across the region turned out in their hundreds to learn all they needed to know about electronic sheep tagging – and potential pitfalls of non-compliance with the new legislation, introduced at the beginning of this year. The event, organised jointly by Craven Cattle Marts and the NFU in Skipton, featured presentations throughout the day from a number of high profile speakers. 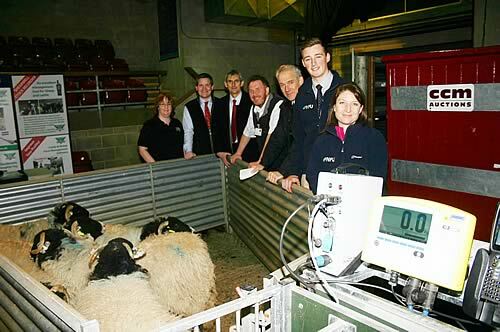 Pictured at the sheep EID drop-in day at Skipton Auction Mart are, from left, Hilary O’Keife, Shearwell Data’s projects manager, Chris Dickinson, NFU West Riding county advisor, Tim Palmer, of Skipton NFU, Ian Cairns, from the Farm Advisory Service, Craven Cattle Marts’ general manager Jeremy Eaton, and Skipton NFU’s Tom Murray and Claire Radley. Tom Fullick and John Royle, from NFU headquarters in Stoneleigh, gave livestock policy updates, while Ian Cairns, from DEFRA’s Farm Advisory Service, shone the spotlight on all-important cross compliance. Pat Brophy, of DEFRA’s livestock and ID team, was another speaker, while Hilary O’Keife, projects manager with animal identification and management systems specialist Shearwell Data, gave live sheep demonstrations of electronic recording in the main sale ring. EBLEX were also present, as well as ARAMS, the Animal Reporting and Movement Service, who are administering the electronic movement reporting system, along with the National Sheep Association. A keynote aim of the initiative was to showcase the latest developments in tag reading, tag reading software and integrated handling systems - and clearly illustrate how they can both contribute and combine to make recording easier. Dedicated Rural Safer Neighbourhoods officers from North Yorkshire Police’s Craven Country Watch initiative were also present. They are now equipped with a scanner to enable roadside scanning and identification of sheep to help tackle rural crime more effectively. Trade stands from a wide cross-section of suppliers involved in the electronic sheep tagging sector also enhanced both the appeal an impact of the day, providing further valuable information to attendees. Gisburn farmer Henry Rowntree, NFU Council Delegate for the West Riding, said “With the new regulations for recording and identifying sheep, we felt it essential that members understand exactly what is required. “We know many farmers worry about failing an RPA inspection, particularly if they are unsure of the rules, as failure can prove very costly and ignorance is no defence. We all know complying with the regulations will involve extra cost and work, but we hope after the drop-in day that farmers are able to adopt a system to best suit them and perhaps some will be able to use EID to improve selection.